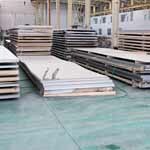 SS Plates, SS Coils, Stainless Steel Plates, SS Sheets, Stainless Steel Hot Rolled Plates Supplier in Mumbai, India. 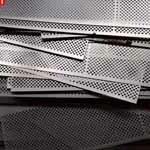 Stainless Steel Cold Rolled Plates, SS Chequered Plate Exporter, ASTM A240 Stainless Steel Shim Sheets, SS Sheets, SS Perforated Sheets Dealer in India. Ganpat Industrial Corporation is one of the prominent trader, dealer and supplier of SS Sheets Plates Coils, which is available at best prices for our customers. The impact energy varies according to product type and production route, whereas the impact strength of welded on these Stainless Steel Plates is slightly less than that of parent metal. Prolonged exposure to the 1100 Degree F – 1600 Degree F temperature range in our Stainless Steel Coils will cause some sigma to form, lowering room temperature ductility and impact resistance. A combination of rare earths and silicon in these Stainless Steel Slatting Coils is responsible for the excellent oxidation resistance of this 21 % Cr alloy. Our Stainless Steel Perforated Coils increase diffusion rate of the silicon to the scale – metal interface, where chips tend to be stringy, cold worked material of relatively high ductility. Rare earths metals in these SS Plates, primarily cerium, increase the number of nucleation sites for the oxide, which results in a fine grained chromium and silica scale. We also offer the same in different grades such as Stainless Steel 304 Sheets Plates Coils, Stainless Steel 316 Sheets Plates Coils, Stainless Steel 310 Sheets Plates Coils, Stainless Steel 317 Sheets Plates Coils, Stainless Steel 316TI Sheets Plates Coils, Stainless Steel 347 Sheets Plates Coils, Stainless Steel 410 Sheets Plates Coils, Stainless Steel 446 Sheets Plates Coils, Stainless Steel 904L Sheets Plates Coils, and more. Stainless Steel Plate Stockholder, SS Plate Cut To Size, SS Strips Stockist, Stainless Steel Plates, Distributors Of ASME SA240 Stainless Steel Coils, SS Grade Polished Plates Manufacturer. Form : Coils, Foils, Rolls, Plain Sheet, Shim Sheet, Perforated Sheet, Chequered Plate, Strip, Flats, Blank (Circle), Ring (Flange) etc. We do care about the quality of our products even some little details are paid attention to. Each order is packaged according to the customer’ s standards including preparation for export such as wooden case, pallet or according to customer’s requirement All shipping documentation is provided for Stainless Steel Sheet, Plate and Coil delivery from mill to customer. Every assignment begins with a visit of our experienced sales representative who assesses the volume / weight of the belongings and brief the client about the nature of packing required as well as various documentation formalities when moving from India. ss plate price, ss plate material specification, ss sheets, ss sheet price per kg, stainless steel sheet price per kg in india, stainless steel sheet price in india, ss sheet weight chart, ss sheet price list in india, stainless steel plate sizes, 2B Finish stainless steel plate price per kg, sus kitchen cabinet stainless steel plate price per kg, mirror stainless steel sheet, decorative embossing stainless steel plate, stainless steel diamond checkered plate, sus stainless steel plate price per kg, inox stainless steel plate in malaysia price per kg, excellent supplier 1.5mm thick stainless steel plates, high quality cold rolled stainless steel plate, ss circle stainless steel round plate, stainless steel round hole punched plate, 4mm thick grade stainless steel plate, stainless steel shower drain mesh plate, cheap stainless steel baffle plate. Coimbatore, Manama, Port-of-Spain, Montreal, Chennai, Lahore, Toronto, Colombo, Al Jubail, Edmonton, Aberdeen, Perth, Vadodara, Hong Kong, Surat, Jamshedpur, Jeddah, Calgary, Gimhae-si, Secunderabad, Chiyoda, Caracas, Indore, Dubai, Rajkot, Petaling Jaya, Atyrau, Muscat, Santiago, Houston, Noida, New York, Bengaluru, Algiers, Granada, Bogota, Mexico City, Howrah, Nagpur, Bhopal, Kuwait City, Faridabad, Singapore, Ludhiana, Thiruvananthapuram, Hanoi, Moscow, Pimpri-Chinchwad, Kuala Lumpur, Milan, Tehran, Rio de Janeiro, Haryana, Karachi, Ahmedabad, Riyadh, Vung Tau, New Delhi, Navi Mumbai, Visakhapatnam, Thane, Ankara, Madrid, London, Geoje-si, Busan, Cairo, Doha, Brisbane, Nashik, Hyderabad, Chandigarh, Kolkata, Baroda, Los Angeles, La Victoria, Al Khobar, Istanbul, Lagos, Gurgaon, Courbevoie, Jaipur, Bangkok, Ulsan, Dammam, Ranchi, Sharjah, Ho Chi Minh City, Seoul, Mumbai, Ahvaz, Dallas, Pune, Ernakulam, Melbourne, Sydney, Jakarta, Abu Dhabi, Kanpur. United Kingdom, Afghanistan, Chile, Costa Rica, Qatar, Slovakia, Taiwan, Hong Kong, Bolivia, Germany, Sweden, India, Canada, Austria, South Korea, Turkey, Namibia, Greece, Mexico, Gambia, Iran, Ukraine, Israel, Bulgaria, Serbia, Gabon, Trinidad & Tobago,Tunisia, Poland, Venezuela, Croatia, Kuwait, Lithuania, Mongolia, Switzerland, Czech Republic, Australia, Spain, Mexico, Colombia, South Africa, Thailand, Angola, Argentina, Iran, Netherlands, Portugal, Bahrain, Chile, Ghana, Yemen, Kenya, United Arab Emirates, France, Vietnam, Singapore, Pakistan, Denmark, Algeria, Poland, Russia, Bangladesh, Libya, Lebanon, Egypt, Norway, Azerbaijan, Philippines, Belarus, Morocco, Tibet, Ireland, Romania, Italy, Peru, Puerto Rico, New Zealand, Malaysia, Iraq, China, Ecuador, Nepal, Saudi Arabia, Finland, Sri Lanka, Macau, Nigeria, Bhutan, Belgium, Nigeria, Kazakhstan, Jordan, Estonia, Zimbabwe, United States, Oman, Indonesia, Japan, Hungary, Brazil.